Hatters boss Nathan Jones has targeted a place in the knockout stages of the Checkatrade Trophy when his side play their final group game at AFC Wimbledon this evening. 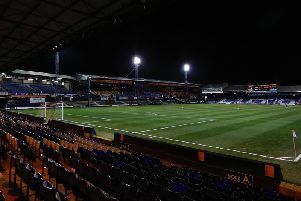 After two penalty shoot out victories in their previous fixtures, Luton go into the fixture on four points, meaning they need only a draw to make sure they are in the second round which takes place during December. I’ve been to Wimbledon before only once in my career and didn’t fare too well, so that taught me a lot about League Two if I’m honest. Jones, whose last trip to the Dons saw Town humbled 4-1 back in February 2016, said: “We’re going to need a minimum point to go through and extend the competition, so we want to do that. “It’s a really competitive game and we like those. I’ve been to Wimbledon before only once in my career and didn’t fare too well, so that taught me a lot about League Two if I’m honest. Although the Dons have struggled for goals in their league campaign this season, scoring a measly nine in in 16 matches, they have been prolific during the Trophy matches, with 4-3 wins over both Spurs U23s and Barnet. On the more open approach to these fixtures, Jones continued: “There’s not as much emphasis put on the three points as not many lose their job over a Checkatrade defeat, and that’s not been disrespectful as we’ve treated the competition and Wimbledon have treated the competition very, very well. “They scored four against Barnet who are a League Two side, so are we. Tottenham are an U23 side, they’ve scored four, but they’ll probably find it a little bit more difficult because League One’s probably a little bit more competitive, so that’s why they’ve probably had that freedom. “I don’t think Wimbledon have taken it any lighter, or Barnet took it any lighter, there’s goals in this competition as it’s a different competition to the league. Although Jones is expected to make a whole host of changes, he has warned those involved, that an impressive performance doesn’t necessarily guarantee them a place in the starting line-up for league matches. On the fixture being a chance for his fringe players to catch the eye, he added: “That has to happen every day, it’s not just you do well in one game for me in a coincidental time we’ve lost a game, the first game in 10, now I’m going to automatically change the team. “It doesn’t work like that. We want players that are in good form over a consistent period of time and they play regularly. “Some would have had a down game in terms of our front three weren’t the most productive against Crawley, but in recent weeks they’ve been electric. “So don’t automatically think you’re going to change anyone, as we want them at it all the time. “We played Peterborough here last week, we won 3-0 and quite honestly it should have been sixes of sevens as we were very, very good.